A Blizzard survey to Diablo III owners asked them to consider a $30 standard edition, and a $50 collector's edition of the Reaper of Souls expansion. If you're a Diablo III owner, you may see an official survey from Blizzard pop up in your inbox, regarding the upcoming Reaper of Souls expansion pack. Among standard questions regarding what games and systems players have, as well as which features of the expansion are most important to them, Blizzard asked players to "Consider two versions of the expansion: a Standard Edition for $29.99 and a Collector's Edition for $49.99." It continued that "The Standard Edition includes the Reaper of Souls expansion; the Collector's Edition includes the expansion, exclusive in-game content, and other bonus items." Traditionally, Blizzard expansion packs (such as last year's Heart of the Swarm) retail for $40, so putting Reaper of Souls at a $30 price-point offers a $10 price cut. 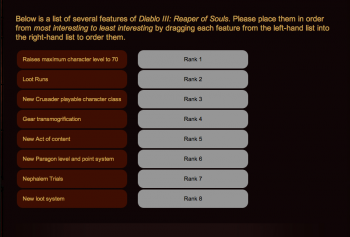 The survey asked players to rank which features of Reaper of Souls were most important to them. The list of features includes: raises max character level to 70, loot runs, new Crusader playable class, gear transmogification, new act of content, new paragon levels and point system, Nephalem trials, and new loot system. "Our goal at Blizzard Entertainment is to make the most epic gaming experiences possible, so we want to get your feedback as a registered user of Diablo III," said Blizzard in the email. This could be a good thing if you're a glass-half-full kind of guy, but if you're a bit of a pessimist, you may be thinking that Blizzard is charging less because of less content. Charging an extra $20 for a collector's edition seems a bit rich, especially if it's only a handful of in-game content.